BJP president Amit Shah on Friday accused the Congress government in Assam of allowing illegal immigrants from Bangladesh to enter the north-eastern state for vote bank politics, which threatened national security.The Bharatiya Janata Party was the only party that did not compromise on national security for vote bank politics, Shah said while addressing a rally here.He claimed that a state free of illegal immigrants was not possible under the Congress rule in Assam.Shah, who arrived here on Friday morning, accused the Congress of entering a "tacit understanding" with All India United Democratic Front (AIUDF), and dared Assam Chief Minister Tarun Gogoi to talk openly with AIUDF chief Maulana Badaruddin Ajmal rather than have a secret understanding. "...main aap logon se poochhna chahta hun kya Congress aur AIUDF aapko Bangladeshi mukt Assam de sakta hain (Do you think Congress and AIUDF can give you a Bangladeshi-free Assam? 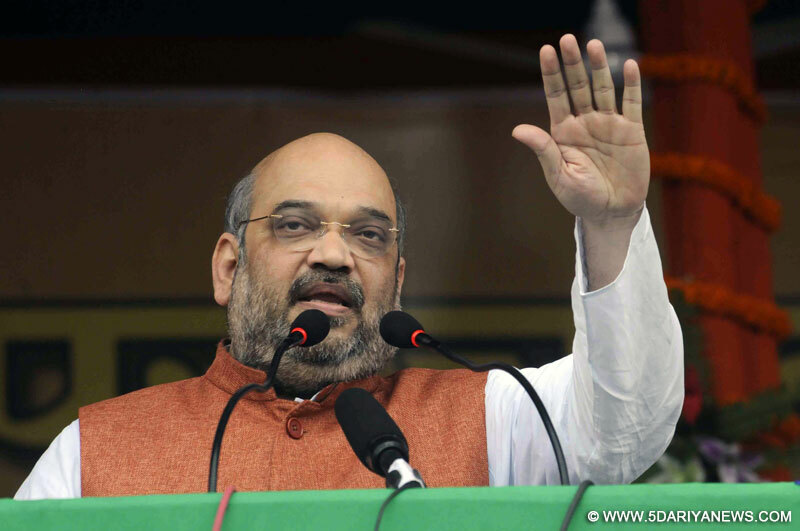 )," Shah said while slamming the alleged vote bank politics of the Congress and AIUDF. Reiterating his party's commitment towards the region's development, Shah mentioned the ongoing Naga peace talks and the extradition of United Liberation Front of Asom general secretary Anup Chetia from Bangladesh and said it was BJP-led central government that was working actively towards regional development. "Assam is a state with international borders. We know the necessity for a secured border. Being a frontal state, Assam needs, above all, a patriotic government, a committed government that understands the importance of national security. Only a BJP government can ensure all these," he said.The BJP president also hit out at the Tarun Gogoi government and said the Congress cannot give a corruption-free administration to the state's people. Shah asked BJP workers in Assam to move from door to door ahead of the 2016 assembly elections and highlight the alleged corruption of the Congress government in the state.Justifying the Centre's move on a land swap deal between India and Bangladesh, Shah said the treaty would help permanently resolve the issue of illegal infiltration from the neighbouring country.